Do you love a good before and after as much as I do? What is it that we love? 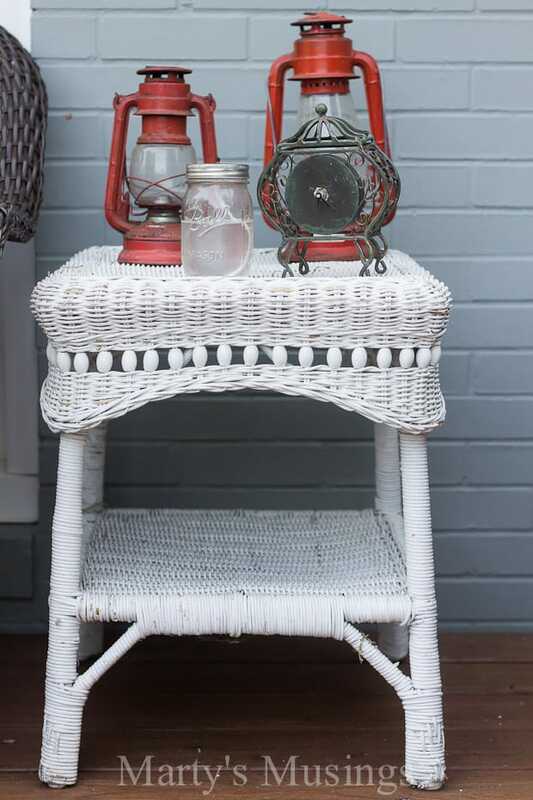 The ugly duckling picture of an unloved house/deck/piece of furniture dying for new life stirs something inside of us. Why does this fascinate us so? I think maybe it’s because it gives us hope. Because sometimes our everyday lives are just plain hard. Okay, more than just sometimes. And hard just doesn’t describe some of those particularly painful days, am I right? I believe deep inside each of us is the desire to hold onto the hope that we can be better, stronger, happier, more amazing. We surf the internet and Pinterest looking for inspiration. What we probably don’t realize is everything we need is inside of us, a gift from a loving God. Strength. Beauty. Determination. Passion. Vision. If I’m honest, I’ll admit that I’m tired and more than a little discouraged. Life has beaten me up pretty hard and I don’t feel very strong, determined, passionate and certainly not so beautiful. 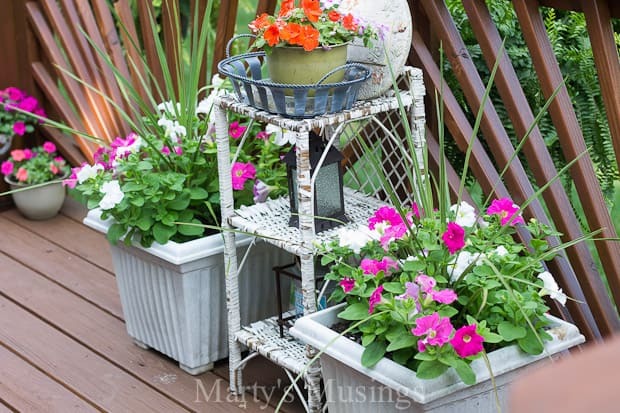 Yet when I spend time on our dream deck I look around at all the curbside, thrown away junk or yard sale treasures and see the new life they bring to our outdoor enjoyment. I feel a little spark of hope being rekindled in me. 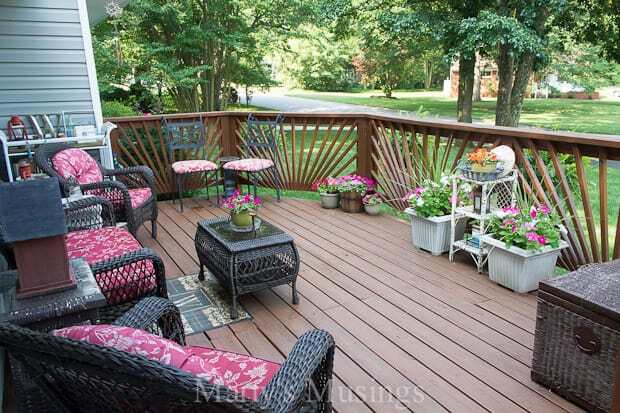 My house is a home and our deck is the fulfillment of a dream. I couldn’t have imagined all the joy this little piece of real estate would bring in the year since it was built. Our rustic, chipped treasures are much like these muscles and bones of mine, aging in spite of my hopes to stay young. 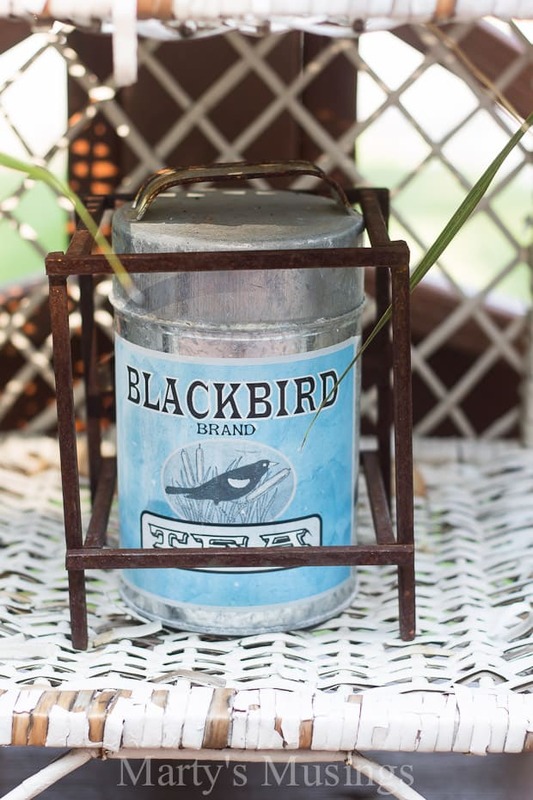 I love buying inexpensive little jewels like this vintage tea container and discovering how to turn these budget decorating ideas into perfectly arranged beauties. There is such history in these well worn, unusual, one of a kind little prizes I discover along the way. 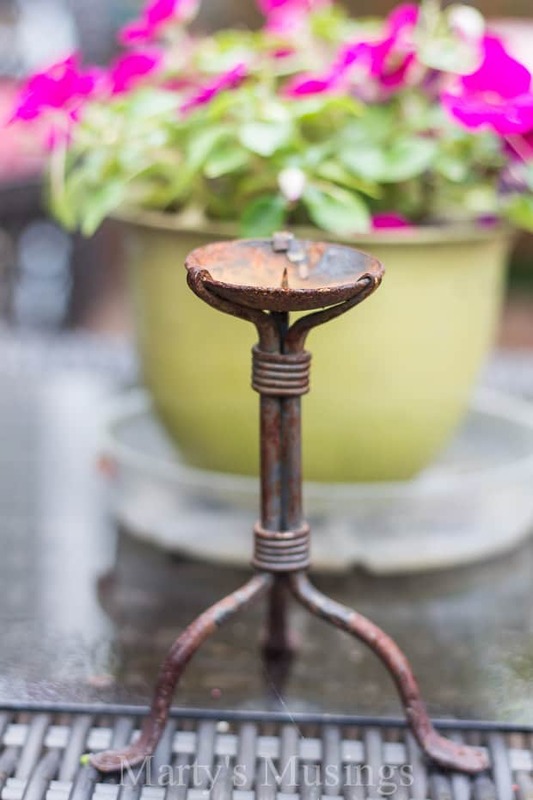 A watering can with a broken handle sits on a chipped castoff table beaten by the rains and storms of the past year. 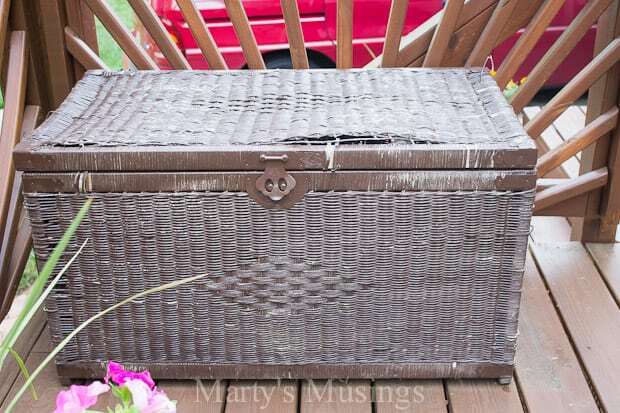 This $10 yard sale chest finds its perfect place by the stairs. 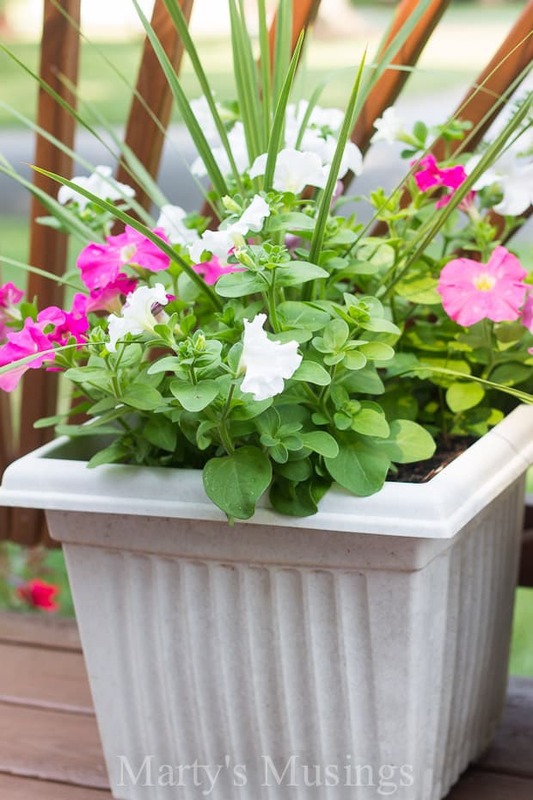 Flower petals drop all over the deck but their beauty lifts my spirits every day. 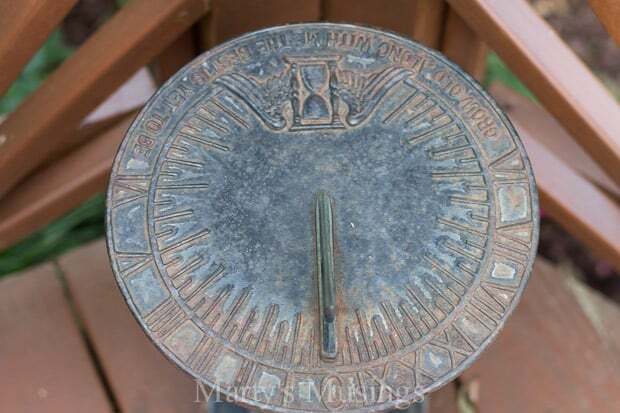 A sun dial marks the passage of time (a gift from a long time neighbor) and resides in a corner all its own. 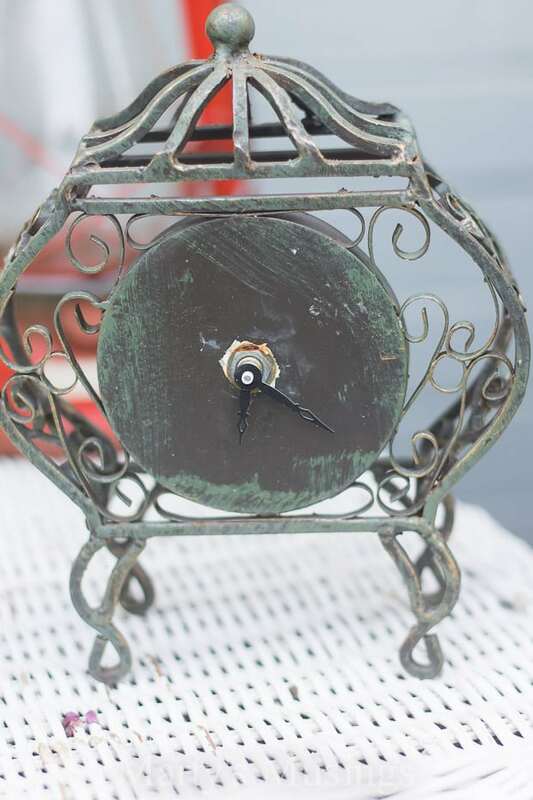 A metal clock that doesn’t work (because who really needs to count time when you’re relaxing and letting the cares of the world dissipate?) 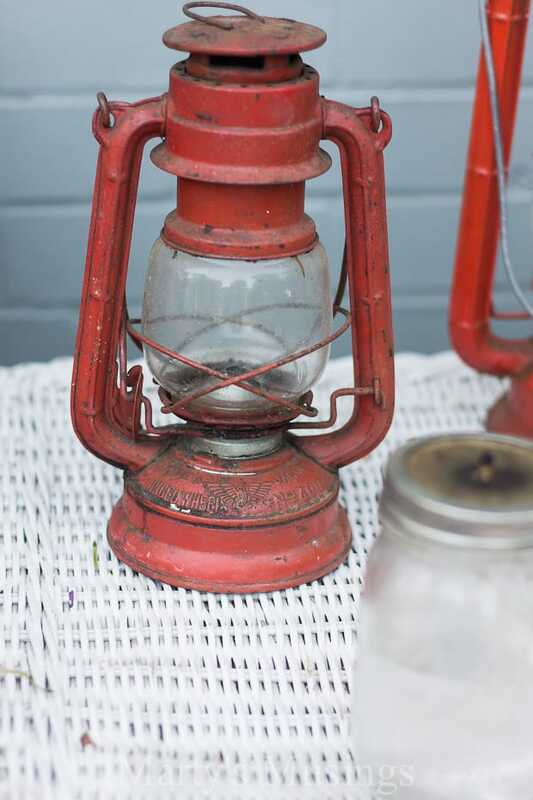 takes center stage on a $3 yard sale table with $1 red hurricane lanterns and a DIY mason jar citronella candle. A quaint corner with a changing table turned garden cart provides a perfect nook for reading in the cooler shade of evening. 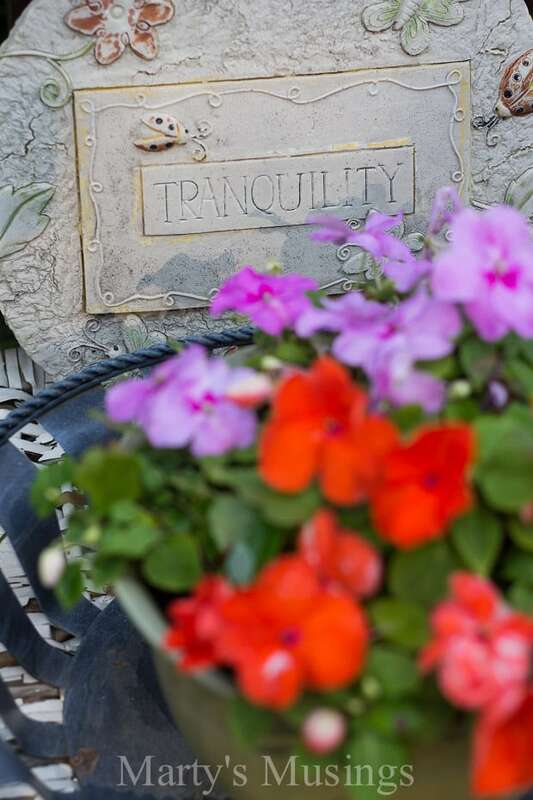 Sometimes you just have to grab tranquility wherever you can. Because the sweetest and most profound dreams are often born in the tiniest slivers of leftover life. 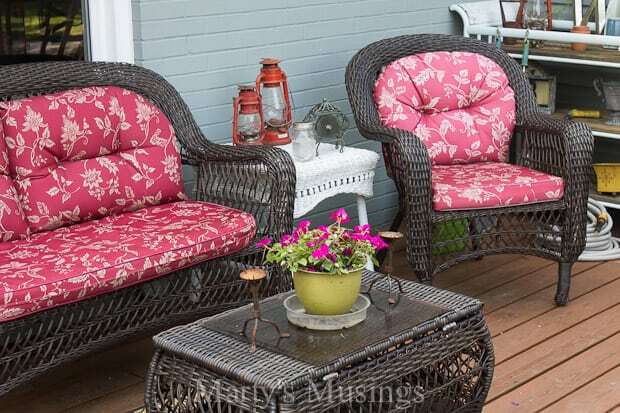 ***Other than the deck furniture (which we got on sale at Big Lots last year) everything is either from a yard sale, found on the side of the road or given to us. What’s your favorite treasure you’ve ever found? Hello; I stumbled on your site and have been reading every post since you began; I am currently at Oct 2013. I was hooked after reading stories about your adopted children. I was a foster mom and can relate to the anguish my daughter felt about being abandoned. (way too much to go into detail ) I envy you…..I love DIYing…only I HATE everything I do…thought about starting a blog of my own and calling it…..Why I hate myself and everything about me !!! Nothing I ever do turns out as I had hoped….. My whole life has been one step forward 10 steps back. Anyways; I do have a question for your husband…..I am currently painting my dresser….HOW do you stop drips? I hardly put any paint on the brush and I still get drips…. 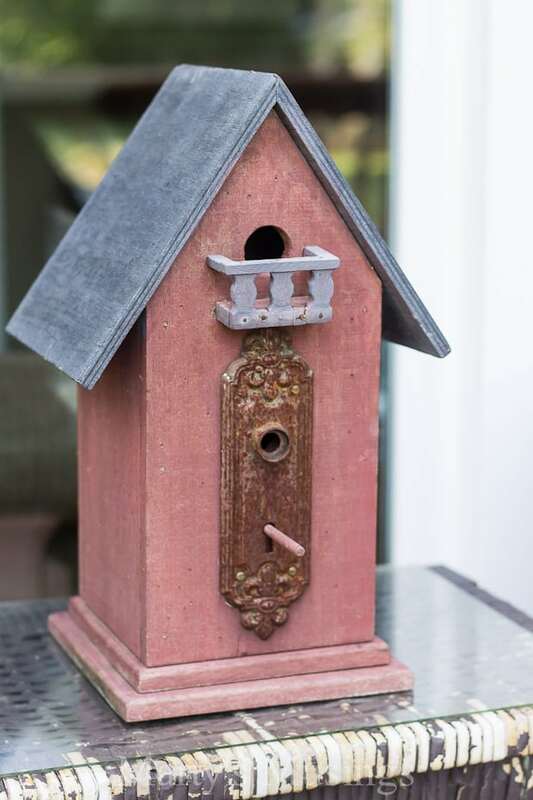 Here’s what my husband says about the drips: If you are using chalk paint (which I would recommend), there are virtually no drips and you actually want to use a criss-cross pattern with your brush. This will almost eliminate drips. 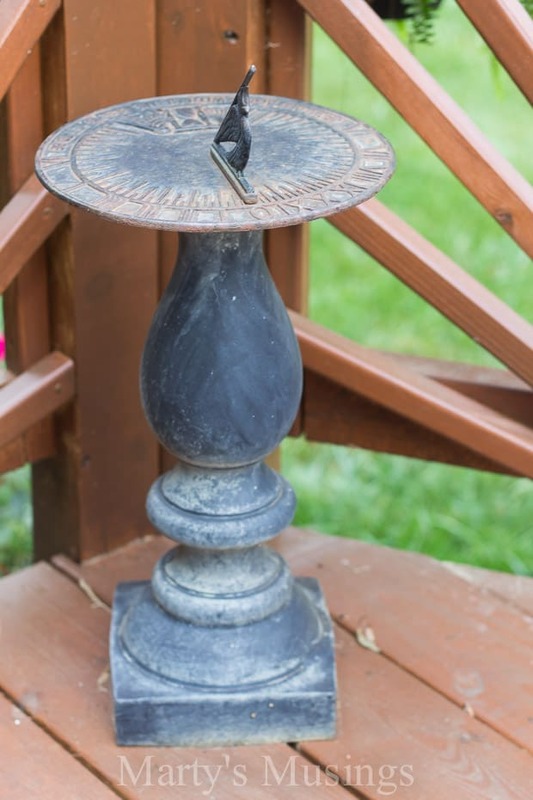 If you are not using chalk paint, there are a couple standard causes for drips. Oil-based paints are notoriously frustrating when it comes to drips. They are typically thinner and are very difficult to control. Cheap water-based paints can have the same performance issue. For both, try upgrading to one of the higher (or highest) grade paints your vendor carries. If your dresser is highly detailed, the drips will be more difficult to control with all products, even the chalk paint. The dimensionality of those obstructions simply cause problems and will force you to just go back and catch the drips before they dry. One last option would be to use an aerosol paint and spray it, but you may not find the color you need. 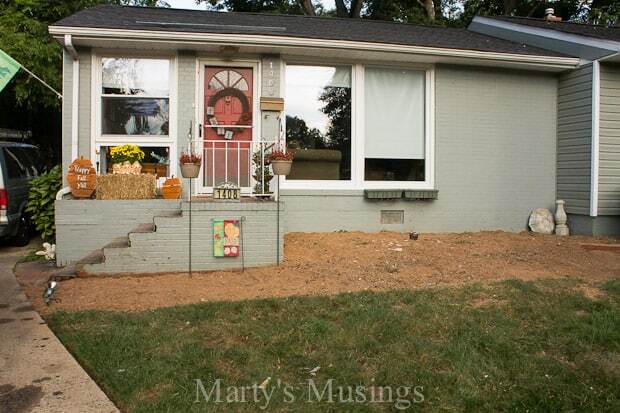 Your deck is even more beautiful in person, Marty! 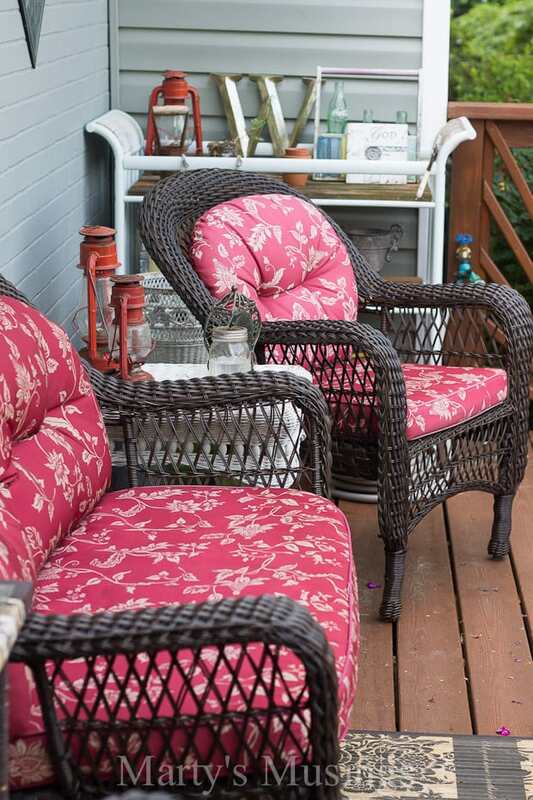 I can’t wait for cooler weather and the death of millions of mosquitoes to join you on your gorgeous deck! HUGS! i was brought to tears at the way you compared yourself to your collection, your words were beautiful, and your story behind each piece inspired me, my tests were not sadness but that someone else compares themselves go days gone by…. As I do, thank you for this it was wonderful to read, look and reminisce. Thank you so much, Debbie. What sweet words you shared. It means so much when a reader takes the time to share how a post touched them. My blog is more than DIY projects and pretty projects. It’s a work of the heart and a sharing of my faith and family. Thanks so much for sharing with me! Thanks for sharing my projects! Have a great week! I love re-purposing items. I hope to hit a few yard sales and flea markets this summer. Thanks for the inspiration. Hi, Rhonda! Summer is definitely the time to hit the yard sales. Good luck and I hope you find some great deals! Hi, Kathy. What sweet sentiments you’ve shared! 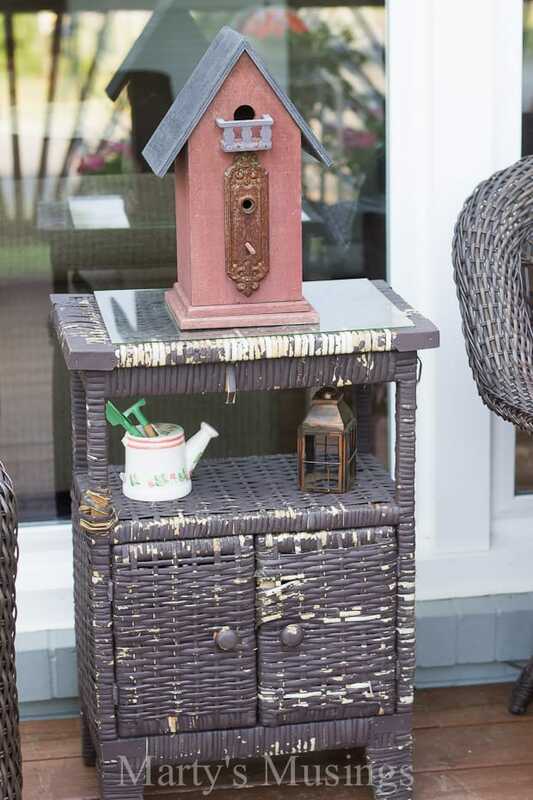 It is harder to wait and bring a room or outdoor space together but I believe that’s what makes it more special and unique. It also allows you to discover your style and look for each individual space. Thanks so much! You know I am all over budget friendly décor. Love these and your pics and so beautiful! Hey, Deborah. You and I certainly do love living on the low side, don’t we? I like a challenge and even if I had tons of money I would still stretch it as far as I could! Yes! So much of this I can identify with. Always striving to be better, more amazing. So true. You have such a fantastic collection of treasures and I’m sure each one of them holds a story that is a treasure in itself. It seems that I have been a member for such a long time. And I have to admit I have not always followed along with you. But today I am going to say that I like the way your site has changed. 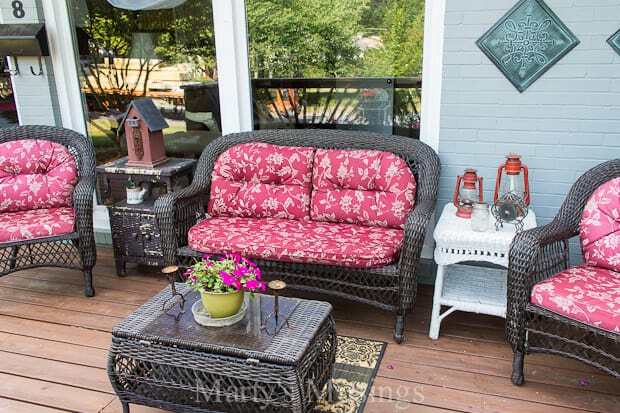 I love the front deck, the furniture, flowers, everything. I only wish I could do that with my little corner of the world. Looks like I am going to have to stop and smell the roses from time to time and see what you have to offer. Thanks for your site. Its awesome. Hi, Ersa. I’m so glad you’re taking time to smell the roses! Stick around with me and you’ll hopefully find inspiration as well as ways to save money and decorate on a budget! Have a wonderful day!